1903: Nebraska tries to arrange a 1904 neutral-site game with Eastern powerhouse Princeton. 1913: In the wake of the dispute over the playing status of Clinton Ross, Nebraska is said to be threatening to drop Kansas from its 1914 football schedule. 1933: Once-beaten Nebraska ends the season No. 2 nationally in an Illinois professor's math-based rankings. Also, the Big Six reconsiders its ban on radio broadcasts of games. 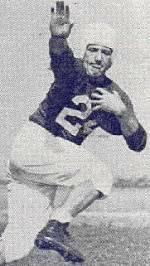 «1943: Former Husker halfback and future NFLer Bob DeFruiter is among the offensive stars as the March Field 4th Army Air Force team downs Pacific, 19-0. 1963: Miami pursues Bob Devaney to succeed Andy Gustafson as head coach. 1983: Tom Osborne is uneasy as oddsmakers list Nebraska as an 11-point favorite over Miami in the Orange Bowl. Dean Steinkulhler, meanwhile, adds the Outland Trophy to his hardware haul. 1993: Respect for Nebraska is in short supply as the Huskers prepare for the national title game. Meanwhile, the Butkus Award goes to Trev Alberts. 1998: Tom Osborne is inducted into college football's Hall of Fame. 2003: Nebraska's coaching search continues as Butch Davis and Dave Wannstedt, two NFL coaches rumored to be on Steve Pederson's short list, say they've had no contact with Nebraska. 2008: Nebraska offensive coordinator Shawn Watson reportedly interviews for the top job at New Mexico. 2013: Tommie Frazier is inducted into the College Football Hall of Fame. Meanwhile, Nebrska draws Georgia as a bowl opponent for the second consecutive year.